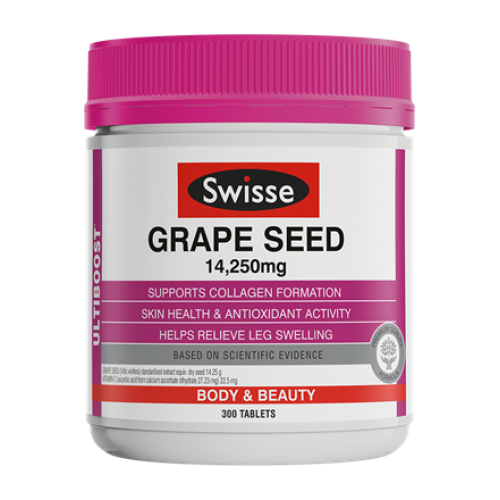 Swisse Ultiboost Grape Seed is a premium quality formula to support collagen formation, provide antioxidant support and help relieve swelling of the legs. Potent Antioxidant: The antioxidant properties of grape seed and vitamin C help protect against free radical damage. Grape seeds contain high levels of procyanidins, a naturally occurring bioflavonoid, also found in fruits and vegetables. Relieve Swelling: Grape seed helps relieve swelling (oedema), heaviness, pain and itching of the legs. Collagen + Grape Seed Extract Extra Strength Bio Island Extra Strength Collagen + Grape Seed Ext..
Swisse Men's Ultivite 50+ Years Swisse Men’s Ultivite 50+ contains 41 premium quality vitamins,..
Swisse Men's Ultivite Swisse Men’s Ultivite is a premium quality formula, containing 53 vitamin..
Swisse Children's Ultivite Swisse Children’s Ultivite is a multivitamin formulated for children..